Birth is inherently risky. Birth outside the hospital adds risk, as there is an unavoidable delay before accessing an operating room, a blood transfusion, or expert neonatal resuscitation in case of an emergency. On average, out-of-hospital birth is 3 times more deadly than birth with a hospital midwife, as I've written about previously. However, some out-of-hospital birth scenarios are higher risk than others, as is shown in the chart below. The Risk Ratio (RR) is calculated from neonatal mortality rates (NNM) with respect to hospital midwives (RR=1). *Mortality rates come from the Vital Statistics data files, on which the Wonder website is based, which allows separation of birth center and home birth outcomes. See the numbers here. Birth attended by other U.S. midwives is 3-4 times more deadly than birth with a hospital midwife. CNM-attended birth at home is 2.5 times more deadly than a CNM birth center birth. 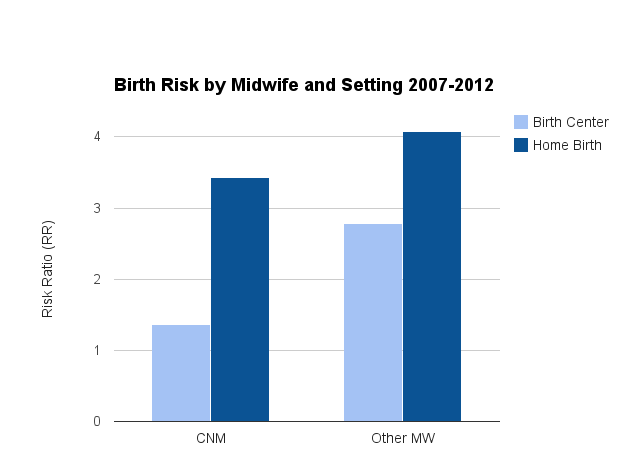 CNM-attended birth at home is just as risky as birth with other U.S. midwives (home or birth center). Certified Nurse-Midwives (CNMs) are the most well-educated midwives in the U.S. They have a Bachelors in Nursing and a Masters in Midwifery. The CNM is a credential developed by the American Midwifery Certification Board (AMCB), which is endorsed by the American Congress of Obstetricians and Gynecologists (ACOG). Other U.S. midwives are direct-entry midwives who lack the education to work in any U.S. hospitals, except for Certified Midwives (CMs), who are AMCB certified and qualified to work in hospitals in the state of New York. But in general, there is a large gap in education between CNMs and other midwives, which likely accounts for the increased risk of births with other midwives. Birth centers and home births both lack timely access to emergency services, but births at birth centers are often subject to a variety of state regulations, whereas midwife-attended home births are regulated to a much lesser degree. This likely accounts for the shameful, more-than-double risk of CNMs at home births compared to birth center births. In fact, CNM outcomes at home births are not significantly different than outcomes of other midwives (home or birth center). In order to make home births safer, midwives should be well-educated and well-regulated. One without the other will only lead to more preventable deaths of babies. Acknowledgment: Special thanks to statistician, Prof. Brooke Orosz. EDIT: Some birth centers are well regulated, while others are not, and the average consumer will have difficulty knowing the difference. Read more here, also shared by Doula Dani in the comments. Previous: Does Using "Pit" During Labor Cause ADHD?